A few weeks ago, a federal grand jury convened in Raleigh, NC to investigate whether state regulators and lawmakers helped shield Duke Energy from taking responsibility for the third largest coal ash spill in U.S. history and from paying for its cleanup. Also under investigation is the state's oversight of Duke Energy's 33 other coal ash dumps at 14 power plants throughout North Carolina, all of which are unlined and leaking coal ash and toxic chemicals into local groundwater. 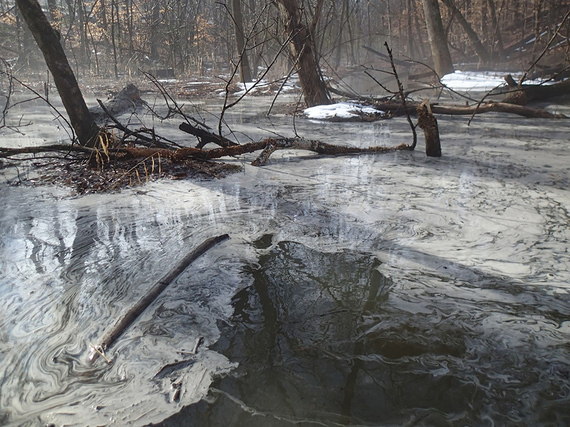 This coal ash spill had occurred on February 2, 2014, when a pipe below the coal ash storage pond burst at Duke Energy's Eden plant, causing 39,000 tons of ash and water to pollute 70-80 miles of the Dan River. When coal is burned to produce electricity, the process also creates coal ash, which contains high levels of arsenic, selenium, lead, mercury and other chemicals known to cause cancer. The Dan River is the source of drinking water for many communities, and nearby Danville, VA's intake source is only six miles downstream from Eden, NC. Duke Energy is a company valued at $50 billion with a $1 million lobbying presence at the North Carolina statehouse. North Carolina Gov. Pat McCrory worked for Duke Energy for nearly 30 years before taking office and implemented a philosophy of "customer service" at the state Department of Environment and Natural Resources ("DENR"), which was supposed to be enforcing environmental regulations on companies like Duke Energy. When local environmental consumer groups sued for cleanup of coal ash leaking into groundwater at two of Duke Energy's plants last year, the DENR had proposed a settlement in which Duke Energy would pay just $99,111. Documents show that the U.S. Environmental Protection Agency questioned the leniency of the fines, and groups like Appalachian Voices, Dan River Basin Association, Waterkeeper Alliance and Southern Environmental Law Center widely criticized this proposal. When the Eden plant spill occurred in February, the state withdrew the proposed settlement. During the grand jury hearings that began on March 18, 2014, artists Greg Lindquist and Mary Mattingly were only nine blocks away from the federal courthouse at the Flanders Gallery, installing "On Land", an exhibition of artworks in response to Duke Energy's environmental disaster and global questions about land use and the environment. Both are respected artists working in New York; Lindquist as a painter and arts writer and Mattingly as a sculptor and performance artist known for site-specific, large-scale public art projects. "As a Wilmington-born native, I feel a special connection to and concern for the environment in North Carolina. [...] The recent Duke Energy coal ash spill is symptomatic of a larger American political problem in which corporations are not held accountable for their ruinous wastes. As recent revelations have shown, Gov. McCrory's and John Skvarla's allegiance to Duke Energy and his degradation of environmental regulations have created toxic environmental, political and social consequences." Lindquist's site-specific, 16 x 38 ft mural Duke Energy's Dan River (2014) depicts shadow-like images of trees, other plants and water in acid-tones of acrylic paint. The motif of swirling air and water presents polluted matter mixing with the environment and serves as a metaphor for the toxic relationships between polluters and accommodating government agencies and lawmakers. Lindquist's drawing Time for Some Water Problems in Eden explicitly shows the swirling patterns of complicity, using text and diagrams to illustrate the connections between Duke Energy, Gov. Pat McCrory and the DENR. Equally powerful in the installation are three totemic sculptures by Mattingly. These sculptures -- Totem 1 (after Waterpod), 2014; Totem 2 (after Waterpod and Flock House), 2014; Totem 3 (after Waterpod, Flock House, and Triple Island), 2014 -- are made with repurposed materials from critically-acclaimed past public art projects by Mattingly named in the works' titles. These totems embody the environmentalist idea of re-using materials to avoid wasting scarce resources and may appear to be beacons of hope amidst the environmental wasteland depicted. At the same time, Mattingly suggests that these structures could be doomed to destruction along with everything else "drowning" in this toxic environment. Mattingly's art involves creating systems of habitation with materials left over from other buildings -- steel conduits that had often been required to cover electrical wiring in the previous structures. 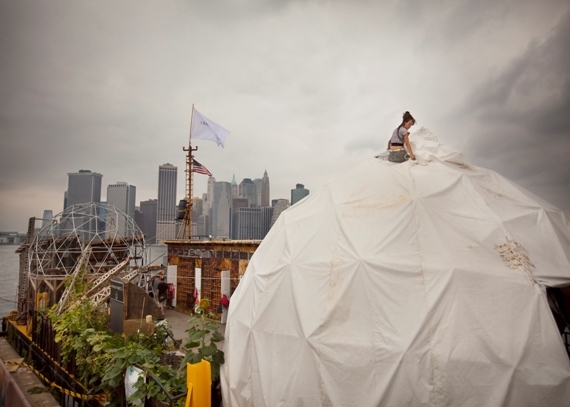 Referencing Buckminster Fuller's geodesic domes, Mattingly considers -- with current political, economic and environmental realities -- the complicated history of utopian hopes for a democratic habitation structure. As a part of this exhibition, the artists and Flanders Gallery have presented public events to promote awareness and dialogue. On March 25, 2014, curator Marshall Price of the Nasher Museum moderated a panel discussion with Lindquist and Mattingly about contemporary art and the environment. And the artists have been presenting lectures at NCSU College of Design, East Carolina University, UNC-Greensboro and UNC-Pembroke. Check out the slideshow and links below for more on the story.